We are happy to announce that we have integrated OTree inside our site. oTree is a Django-based framework for implementing multiplayer decision strategy games, created by Daniel Chen, Martin Schonger, and Chris Wickens (http://www.otree.org, "oTree - An open-source platform for laboratory, online, and field experiments", Journal of Behavioral and Experimental Finance, vol. 9, n° 1, 2016, p. 88–97). Otree is a great software, free, open-source and very easy to use. If you have a little time, we would highly recommend you to code your own game (in Python): Everything is very clearly explained on the oTree website. If you do not want to host your own server, you will find here several of the introduction games that are delivered with oTree. We also developed several games based on oTree and others will be added on a regular basis. If you have coded your own game or experiment and feel like publishing it in open access on this platform (or if you want to share a pedagogical document about existing games), do not hesitate to contact us. Each of you will be asked to pick a number between 0 and 100. The winner will be the participant whose number is closest to two-third of the average of all chosen numbers. The winner will receive 100 points, while other participants will receive nothing. In case of a tie, the 100 points will be equally divided between winners. Players must bid for an item that is being auctioned. Prior to bidding, each player will be given an estimate of the actual value of the item. The estimates may be different between players. The actual value of the item, which is common to all players, will be revealed after the bidding has taken place. Based on the value estimate, each player will submit a single bid within a given range. All bids are private and submitted at the same time. The highest bidder will receive the actual value of the item as payoff minus their own bid amount. If the winner's bid amount is higher than the actual value of the item, the payoff will be negative. In the event of a tie between two or more players, the winner will be chosen at random. Other players will receive nothing. You have been randomly and anonymously matched with another 2 participants in an auction. Each of you is given 100 points to start. Before bidding, you will learn the value of the object to you. The value of the object differs from participant to participant and is randomly and independently drawn from 0 to 100 for each participant. At auction, you will privately submit one bid for the object. A bid can be anything from 0 to 100 points. The participant with the highest bid wins the object and pays the second highest bid. A random device will select the winner in the event of a tie bid and the winner will pay the highest bid other than her or his own bid. The payoffs for others are the initial 100 points. In this game, you will be grouped randomly and anonymously with another 2 participants. One of you will be randomly assigned to be the buyer and the other 2 the sellers. Sellers and the buyer can trade for 3 periods. Prior to making any decision, you will learn your role, which will remain unchanged for 3 periods. The buyer can buy up to 1 unit of the commodity during a period and each seller can produce up to 1 unit in a period. Unsold units are not produced and hence incur no cost. First, every player will be randomly paired with another player. In other words, you will have a counterpart, but you will not be told who it is. Your identity will also remain hidden from your counterpart. The two participants in a pair will have two different roles: the proposer and the responder. You will be assigned randomly to a role, and it will be displayed on the next page. The two of you will together receive 100 points. The experiment is about how to divide this amount. The proposer will make the responder a take-it-or-leave-it offer, which the responder can accept or reject. If the offer is rejected, both will receive 0 points. The proposer has the following 11 options on how to divide the 100 points between the two players. The responder can either accept or reject the offer. 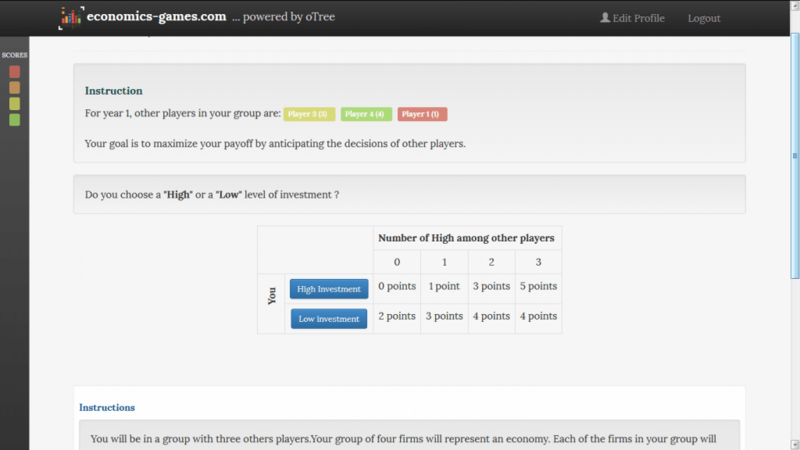 In the end, when both players have made their decision, a results page will be displayed. Here the offer will be displayed once more, and whether it was accepted or rejected. In this game you will play 10 rounds of "Matching Pennies". At the beginning, you will be randomly assigned to an opponent. Player 1 chooses either "Heads" or "Tails". Player 2 guesses what Player 1 chose. If the guess is correct, Player 2 receives 100 points and Player 1 receives nothing. If the guess is incorrect, Player 1 receives 100 points and Player 2 receives nothing. You have been randomly and anonymously paired with another participant. Now please image the following scenario. If both claim the same amount, then this amount will be paid to both. If you claim different amounts, then the lower amount will be paid to both. Additionally, the one with lower claim will receive a reward of 2 points; the one with higher claim will receive a penalty of 2 points. You have been randomly and anonymously paired with another participant. One of you will be selected at random to be participant A; the other will be participant B. You will learn whether you are participant A or B prior to making any decision. To start, participant A receives 100 points; participant B receives nothing. Participant A can send some or all of his 100 points to participant B. Before B receives these points they will be tripled. Once B receives the tripled points he can decide to send some or all of his points to A. You have been randomly and anonymously paired with another participant. There are 100 points for you to divide. Both of you have to simultaneously and independently demand a portion of the 100 points for yourselves. If the sum of your demands is smaller or equal to 100 points, both of you get what you demanded. If the sum of your demands is larger than 100 points, both of you get nothing. You have been randomly and anonymously paired with another participant. Each of you will represent a firm. Each firm manufactures one unit of the same product at no cost. Each of you privately sets your price, anything from 0 to 100 points. The buyer in the market will always buy one unit of the product at the lower price. In case of a tie, the buyer will buy from one of you at random. Your profit is your price if your product is sold and zero otherwise. In this game, you will be paired randomly and anonymously with another participant. You will go for a hunt together. Each of you has the choice of hunting a stag or a hare. If you choose to hunt a stag, you can only succeed with the cooperation of the other participant. You can get a hare by yourself, but a hare is worth less than a stag. In each cell, the amount (in points) to the left is the payoff for you and to the right for the other participant.